Any time, anywhere. Our towing service and fleet of trucks work around the clock, 24 hours a day, seven days a week to give you a lift when you need it most. At Mobile Maintenance & Towing, we take pride in our fast arrival time of less than 30 minutes, coupled with our 24 hour dependability. We tow any size of vehicle from light-duty up to 70,000 lbs in super duty bulk. Plus we’ll go the extra mile and tow vehicle truck to our own repair shop or other location. Need a tow? Call us. 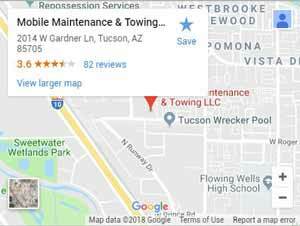 Our round-the-clock tow truck technicians will be there in 30 minutes or less. We specialize in light duty, commericial, heavy duty, and super duty towing. Whatever size job you need, we have the capacity for it. We have the engineering and torq to pull everything from your pride and joy Harley to a tractor-trailer combo. Tractor and Trailer Combo – We pull tractor-trailer combos in excess of 17,000 pounds. Private Property Removal – We tow away any vehicles illegally parked on private premises at the request of the property owner. Winch-Outs – For vehicles stuck in embankments, ditches, or deep sand after a flash flood, we perform winch-outs with trucks that have flat beds or booms. Accident Recovery – For totaled or wrecked vehicles, we load up your vehicle and transport the wreckage. Rollover Assistance – We use our high capacity booms and pulleys to upright your vehicle and transport vehicles to our shop if needed. Onsite Repairs – Our mechanics can arrive in 30 minutes or less for quick fixes. Equipment Hauling – We can haul heavy-duty machinery up to 17,000 pounds in excess. We dispatch mobile mechanics to perform the necessary fixes on your car or truck. Our mechanics do auto repairs on site. If your vehicle needs more aggressive fixes, we can transport your car, truck, RV, and trailer to our shop for quality maintenance. © 2019 Mobile Maintenance and Towing LLC. All Rights Reserved.